Confession: I have yet to actually frequent Caffe Artigiano. I do think they have a wonderful store front however. Reflections in glass are a big thing I would like to keep focusing on, as well as reflection into a wet street. So fun! I did really enjoy the way the glass feature above the signage turned out. The Emergency Response Centre – I was unaware of the existence of this building which was completed right around the time of the floods last year. It was really interesting to read up on though, essentially a bunker built more or less entirely underground. The initial response from the community was that they really didn’t want a concrete eyesore in the middle of the community and right beside a park no less. The architect took care to use reflective materials and glass for fencing to create an open and transparent feel. The panels on the building actually somewhat reflect their surroundings and especially the colour of the sky. 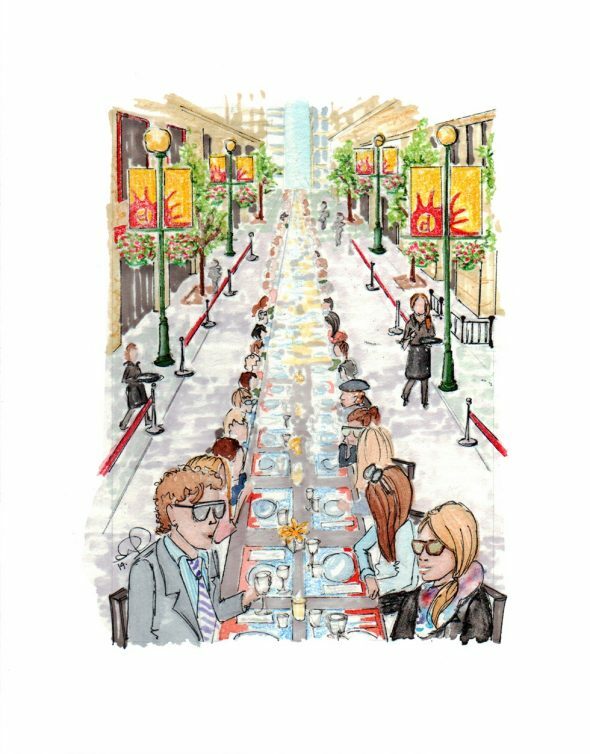 Supreme Menswear: we actually did not end up using this sketch for the final winners,so I hope I’m not giving away any trade secrets here. I just had so much fun with rendering it! Getting the reflection of the skyline into the glass, incorporating just a touch of two point perspective for the curvy corner facade and trying to capture the interior lighting on the main floor. Oooooh hi. I remember walking by the Wonderland sculpture after it was erected out front of the beautiful new Bow Tower last year. When I was first sent the image to render I had to take a deep breath and tell myself: Challenge Accepted. And lastly – I think this event was called the really long dinner table. Another image that should have sent me into a fearful stupor, but at that point I was so entrenched in working on the winners that I just put my head back down and muscled through drawing an endless dinner table. One more thing to learn: where do you start eliminating detail to create a vanishing effect in single point perspective? There they are! These were all created as 5″x7″ images on watercolour paper using a combination of watercolour, prisma markers and my ancient Laurentian pencil crayons that I am quite sure I have had since elementary school. I was quick to treat myself to a new set of 132 Prisma pencil crayons with my commission earnings and I have been happily colouring up a storm in my study since. Thank you again to the Downtown Calgary Association for giving me this opportunity for the second year in a row! This entry was posted on Monday, May 12th, 2014 at 3:52 pm. 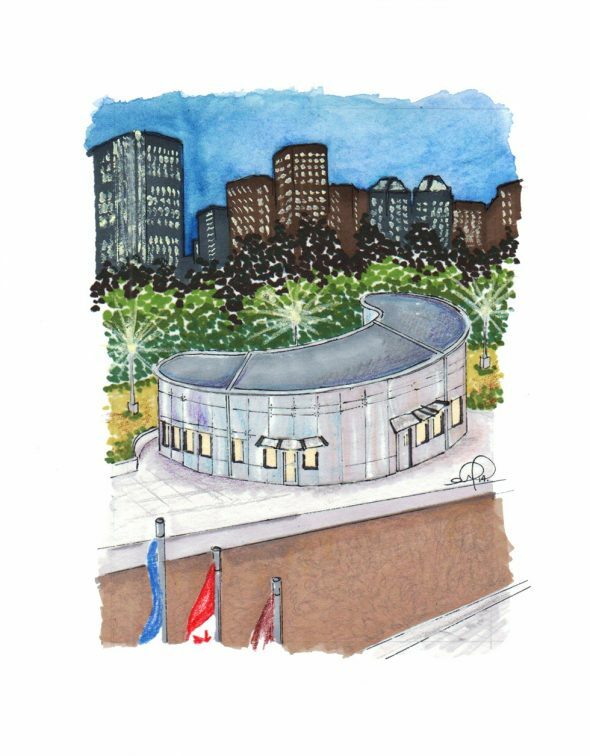 It is filed under Commissions and tagged with Downtown Calgary, prisma markers, rendering, watercolor, yyc blogs. You can follow any responses to this entry through the RSS 2.0 feed. Love love love the head statue! Great job on these Steph! Architectural renderings are so fun, I can tell you really poured your heart into these. thank you Meagan! I really did enjoy these – and it was refreshing to step away from figure drawing for a while!